Signed by Katharina Röder von Rodeneck on St. Nicholas day 1540 (6 December, f. 205v). Illuminated manuscript in German, written on paper. Binding in a folded leather pouch with a knot, to loop over or slip under a belt (possibly secondary covering, 17th century?, replacing an older binding?). 98 x 76 mm. – 206 leaves, with 5 drawings in pen and wash including birds, text-scrolls, coat of arms and devices/emblems, 1 miniature painted on vellum inserted (but contemporary) on a single leaf (f. 9). Prayerbook, illuminated manuscript in German, written by Katharina Röder von Rodeneck. Germany, Convent Frauenalb, completed on 6 December 1540. 98 x 76 mm, 206 leaves, 5 drawings in pen and wash, 1 miniature painted on vellum inserted. ff. 2v-3: An owl clutching a heart in his talons; Death holding an hourglass and a scythe. ff. 3v-4: An owl holds the coats of arms of Thomas Röder von Rodeneck and Lucia von Sternenfels; A pigeon holds the coats of arms of Von Zeiskaim-von Remchingen and Nothaft von Hohenburg. Prayerbook in German made by and for Katharina Röder von Rodeneck, a nun at the convent Frauenalb. One of the very rare surviving girdle books, this is a small gem that transmits the ambiance of the Middle Ages to today's readers. A girdle book could be easily carried about. 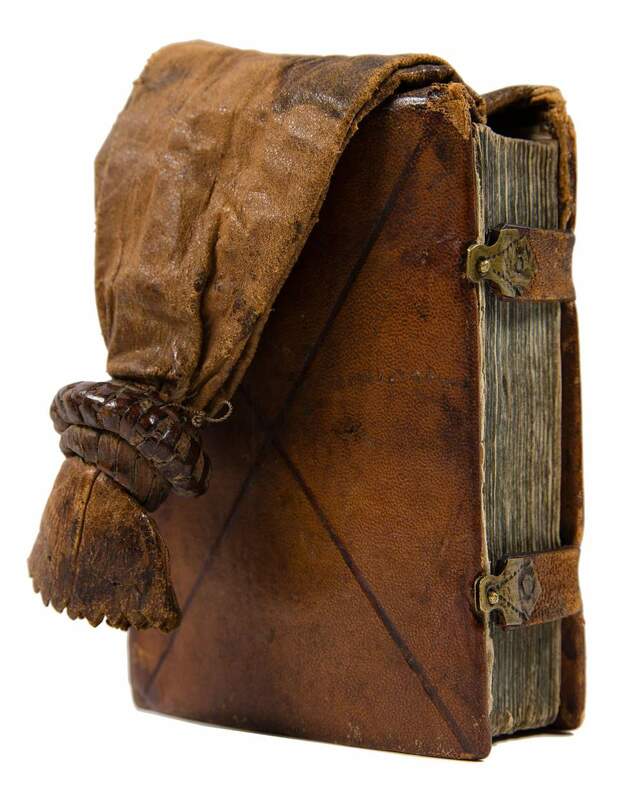 Often of small size, the codex itself was encased in a folded leather pouch that was worn suspended from a knot looped over or slipped under a belt where it would dangle until needed. The book-block was often sewn into the pouch upside-down so that the text could be read without detaching it. Such books are frequently seen in medieval paintings and sculptures but are extremely rare today. Only a total of 23 medieval girdle books have been preserved. The dark stained leather of the present manuscript suggests the book was often carried by its pouch. Katharina Röder von Rodeneck finished writing on 6 December 1540 (f. 205v). She further added that she was professed on 21 November 1515 at the convent Frauenalb (f. 5v). The drawings include the coats of arms of Thomas Röder von Rodeneck and Lucia von Sternenfels, Katharina's parents. The Stift Frauenalb (south of Karlsruhe, Germany) housed mainly aristocratic daughters. Its grand ruins still are impressive today. The rather personal prayers are divided over the days of the week and most of them end with references to pray the Pater Noster and Ave Maria. As various pages show some thumbing, wear and tear, Katharina used her book for which it was made, that is, for her own prayers and contemplation. The charming drawings and text scrolls, presumably all by the hand of Katharina Röder von Rodeneck herself, add considerable significance to the book. This work is now in the collection of the Badische Landesbibliothek in Karlsruhe.